Ever wanted to sip on pure lemon juice like it’s a sweet glass of lemonade? With the aid of ingesting the newly popularized miracle fruit, people all over are experiencing a temporary but astounding transformation of their taste buds. Ingesting a piece of the small red berry, or dissolving a tablet made from miracle fruit, flips perception from sour to irresistibly sweet (Brouwers, 2011; Farrell & Brakken, 2008; Park, 2009). 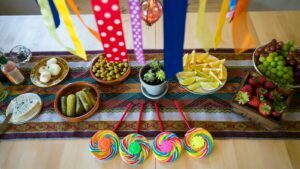 The widespread use of miracle fruit has lead to the formation of “flavor tripping parties.” At these events, dozens of people may come together to experience the effects of miracle fruit firsthand. Party hosts may charge a small entrance fee (Farrell & Brakken, 2008), and guests can experiment with a variety of food and drink to tantalize their transformed taste buds thanks to miracle fruit. Popular choices include hot sauce, lemons and limes, sour candies, and vinegar based foods or drinks (Farrell & Brakken, 2008; Park, 2009). These are considered popular choices because of their sour attributes. While the effects of miracle fruit may appear as a miracle or a magic trick, there is surprisingly a good amount of science behind it. To understand the process of how sour foods change to tasting sweet, it is important to review the basics of how taste (gustation) works. Our gustation system consists of several regions including the tongue, the nose, nerves, and the brain. On the tongue, there are several chief mechanisms that help sense taste. One of the most essential and well known are the taste buds. Each taste bud has several cells called taste receptors which receive input from food to detect the taste. The taste receptors are only able to detect one of four basic tastes; sour, salty, sweet, and bitter. Each receptor corresponds to one specific basic taste. 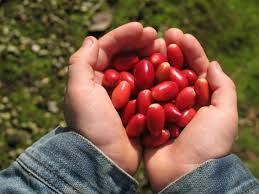 When we consume miracle fruit, a protein called miraculin binds to the sweet receptors in the taste buds. The binding does not immediately send signals to the brain, however, as acid needs to be present in order to activate the signals that tells the brain sweetness has been detected (Koizumi et al., 2011). This is why miracle fruit can change the taste of sour tastes and not others. Scientists debated about whether or not miraculin suppressed sour receptors or activated sweet receptors and found that both sour and sweet taste signals are sent to the brain (Bartoshuk et al., 1974 and Yamamoto et al., 2006). As the signals arrive at the brain, the sour signal weakens and the sweet signal becomes the dominant message the brain receives (Yamamoto et al., 2006). This phenomenon is known as mixture suppression and often happens when strong tastes compete for the most prominent taste. Normally, when we consume something like a lemon (which has both sour and sweet flavors), the brain receives citric acid (sour) signals at a slower rate than sucrose (sugar) signals (Yamamoto et al., 2006). This leads sour to be the predominant taste as it comes after sweet, replacing the sweet signal with sour. When you eat miracle fruit and then have sour food, both sweet and sour signals are received at the same time and it is up to the strongest signal to determine which one is tasted. Sweet has a stronger signal than sour which allows the sweet signal to ‘win’ the battle for the most dominant taste and leaves the individual tasting sweet instead of sour. Step 1: Check in your local grocery store for miracle berries, but getting them through Amazon is the most convenient way. Step 2: Invite some friends over for a flavor tripping party! Get a variety of sour and tart foods for your party guests to feast on. Step 3: Chew the miracle berry for at least 30 seconds before swallowing. If you have a miracle berry tablet, let it melt and dissolve on your tongue. The effects occur immediately. Step 4: Start tasting a variety of foods. The effects of miracle berries last from 30-60 minutes on average. Step 5: Always make sure to flavor trip safely! Keep water around. It may also be helpful to have Tums or Alka-Seltzer around as some foods are very acidic. Despite the fact that you may not perceive them as acidic due to the effects of the miracle berry, they can hurt your stomach if you eat them in excess. Bartoshuk, L. M., Gentile, R. L., Moskowitz, H. R., & Meiselman, H. L. (1974). Sweet taste induced by miracle fruit (Synsepalum dulcificum). Physiology & behavior, 12(3), 449-456. Koizumi, A., Tsuchiya, A., Nakajima, K. I., Ito, K., Terada, T., Shimizu-Ibuka, A., … & Abe, K. (2011). Human sweet taste receptor mediates acid-induced sweetness of miraculin. Proceedings of the National Academy of Sciences, 108(40), 16819-16824. Yamamoto, C., Nagai, H., Takahashi, K., Nakagawa, S., Yamaguchi, M., Tonoike, M., & Yamamoto, T. (2006). Cortical representation of taste-modifying action of miracle fruit in humans. Neuroimage, 33(4), 1145-1151.